This page is for longer articles about A&S SARs work, training and thoughts. Six team members visited the Austrian Tirol for a week in August 2011 not only to climb, but also to take up an offer to train with the local mountain rescue team and explore new techniques. 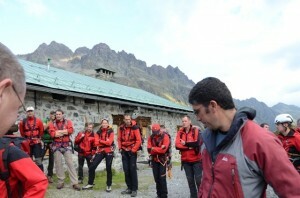 The members were based in Jamtal Hut (2165m) close to the Swiss frontier. 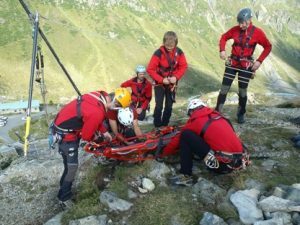 The first two days were spent training with the Tiroler Bergrettung, the Tyrolean Mountain Rescue Organisation, in their local alpine training centre in Jamtal. The member were introduced to the Tyrolean approach to rope work. The Tyroleans have developed a special Dyneema rope rescue system, the weekend’s objective was to introduce and test local members in their Dyneema skills. Theory was followed by a practical introduction to the Dyneema roping system and the technical principles that form the core of their system of Mannschaftsseilzug (team pulley system) and Mannschaftsseilrolle (team roping system). from crevasses, gorge rescue using a Tyrolean lift system and the Dyneema systems of Mannschaftsseilrolle and Mannschaftsseilzug. The members are very grateful for their hospitality and for having been given the chance to train alongside them. The members then exploited what turned out to be some of the best weather conditions Austria’s had in a long time for several mountaineering trips, including ascents on several of the local glaciers and the wide variety of via ferrata (Klettersteige) with the members climbing several iron ways in the Ötztal area. techniques. The team is looking at which of these techniques may be adapted for possible use around the gorges, cliffs and quarries of the Avon and Somerset area and to compliment its own rope systems. They had only left their houses for a moment. Now they were stranded on shrinking dry islands with rising floodwater cutting them off. Whirlpools formed above drains and culverts, whilst the water boiled out of others. With only the clothes they walked out in they were now isolated and scared. Yet often only meters’ from their homes. How high would the water go? Two teams of red figures emerge, passing each other as they searched, and then move on down the road. The stranded are helped to a receiving area for medical and welfare checks. The chain-of-care is now in place and working. From searcher to medic, into one of the teams rescue boats and away to the control point and safety. This is an Avon and Somerset Search & Rescue flood training exercise. The exercise is looking at the logistics of a wide area flood, search and rescue operation with multiple casualties. The team is also looking more closely at the support needed for all the individuals involved. This support element is crucial for keeping team members out searching, getting the right kit to them, both rescuers and the casualties welfare and looking after them when they return. This either being handed on to the health or social support agencies for the casualties or for the rescuers so they can be deployed again quickly and efficiently somewhere else as the incident requires. 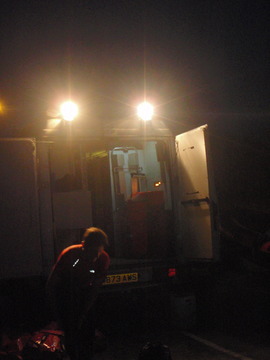 The team has moved en masse to the South Hams area of Devon nr Salcombe. The Aveton Gifford estuary and causeway are the perfect natural environment for simulating a flooding environment where everything and every aspect is dynamic. The tide is coming in and it’s getting dark in real time. A&SSARs new Flood Rescue Support vehicle is being tested fully for the first time. Supporting, Swift Water Rescue teams, Flood Rescue Boat operations along with specially trained Bank Side search and rescue teams equipped with new bespoke personal wading kit, rescue and safety equipment. After this flood rescue exercise in the estuary the team moved down to Salcombe Harbour and the Kingsbridge Salcombe estuary. More testing of kit and systems this time, simulating and exercising the rescue of people from isolated and exposed positions, such as from the top of the roof of submerged cars. An inflatable craft, with a hauling and pulley positioning system and tethering lines were all used or deployed to ferry stranded people and rescuers back and forth with amazing control. Boat handling skills and recovery of casualties from open water are then practiced in this rapidly ebbing spring flood tide as it is going out, marking the end of two days of training, exercise and testing. These exercises have proved an incredibly valuable learning experience for all. The team has learnt how much effort is needed to maintain discipline order and efficiency of operations, both overall and at the control area. Individuals have tested and become more at one with the wide variety of equipment, boats and assets that will be deployed along with identifying and conversant with the specialist personal kit requirements. And lastly but by no means least the various individual members of Salcombe and South Hams Business community and Residents without who’s kind help and support these events would not be possible.